Whose spring game attendance will beat Florida State? If everything goes as planned, we will be crowing this year’s college football national champion this weekend… for spring football attendance. After last week’s spring attendance figures were calculated, Florida State is the team to beat. It just so happens that three programs which regularly draw exceptionally well for the spring game and another jumping into the fray as a national spring game attendance leader are all in action this weekend. Last year’s national championship game participants, Alabama and Georgia, each figure to outpace the Seminoles, as should Big Ten programs Nebraska and Penn State. But aside from crowning this year’s spring game attendance champion, this latest jam-packed weekend has plenty of storylines to follow. 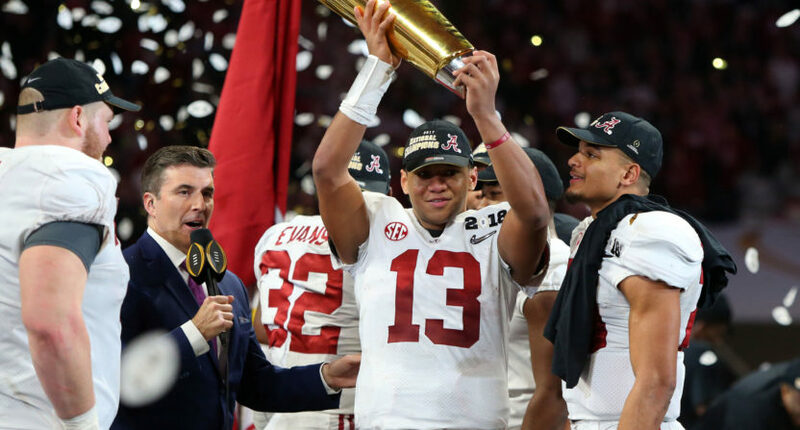 The defending national champion Alabama Crimson Tide will be without title game hero Tua Tagovaila due to injury. The other defending national champions, UCF, have a new head coach. Scott Frost makes his much-anticipated debut at Nebraska. Lane Kiffin’s FAU program is in action, as are Oregon, Washington, Tennessee, and Texas. And at UCLA, Chip Kelly’s back! If you plan on spending Saturday in front of the TV and not watching playoff basketball, here is how you can get your college football fix this weekend. All games scheduled for Saturday, April 21. All times are Eastern. You can see a full spring football schedule that includes games not being televised in any capacity via FBSchedules.com. 1. No Tua for Alabama. Will Hurts take advantage? Alabama’s quarterback position was already scrutiny after the national championship game, but things may have gotten more interesting this week. We knew Tua Tagovailoa was going to be out (and may be out for much of the summer too) due to a broken bone in his throwing hand. After Nick Saban announced a setback in Tagovailoa’s rehab, Jalen Hurts will get more reps in the spring game. And if things don’t work out for Hurts, he could potentially be on the move. Replaced by Tagovailoa in the national championship game after halftime, the rest of the story does not bode well for Hurts. But he still has plenty of skill and potential to offer at Alabama and Saban has not made any decision about his starter in the fall. The pressure will be on for Hurts to shine in the spring game. If he struggles, the writing could be on the wall. Even though Alabama loses their typical number of players to the NFL this season, the spring will show how deep the roster has become through recruiting and player development. A similar story may play out at Georgia months after the Bulldogs let a national championship slip away. Similar to the Tide, the quarterback situation will be under a microscope with no wrong answer. Jacob Eason left Georgia and has landed at Washington. This decision was made after Georgia played their way to an SEC title and the national championship game with freshman Jake Fromm at the helm. Fromm will likely remain the starter, but the spring game will be a chance to witness prized 2018 recruit, Justin Fields. Fields likely won’t win the starting job away from Fromm even with a stellar spring debut, but Kirby Smart may not hesitate to make a switch in the fall if it means Georgia has a better chance of winning. Georgia’s running back situation could be more entertaining. After losing both Nick Chubb and Sony Michel, the Bulldogs will now look at a combination of D’Andrew Swift, Elijah Holyfield (son of Evander) and, most likely, Brian Herrien. Georgia should be loaded at the running back position. At Nebraska, a new era with the golden child returning home begins in front of a packed Memorial Stadium crowd decked out in their finest Husker red. Scott Frost, coming off an undefeated season at UCF, makes his spring debut as Nebraska’s new head coach and he has a fair amount of work to do. Nebraska is looking to revamp its offense under Frost, and he will have to make some decisions at key positions as the rebuild begins. The quarterback position has very little experience to rely on out of the gates, but early enrollee Adrian Martinez will get his chance to show what he can do. Martinez was one of the first key recruits for Frost at Nebraska. But if the Huskers don’t start showing improvement on defense, it could be another up-and-down season. If I were giving Frost advice, it would be to focus on protecting the football. Doing some Nebraska spring work today and wanted to share this with you. Since joining the Big Ten in 2011, Nebraska has a cumulative turnover margin of -40. That is incredible for all the wrong reasons. Ahh yes, the return of Chip Kelly. After flaming out during four years in the NFL after leaving Oregon and spending one year in the TV studio with ESPN, Chip is back where he belongs: in the Pac-12. With Kelly back in the game out west, UCLA will have a new offense that continues to work on Kelly’s up-tempo style. While we shouldn’t expect Kelly’s return to automatically lead UCLA to contend for the Pac-12 title, it will be interesting to see how far along the new style is coming along for the Bruins. As for the outlook of Kelly and UCLA? Expect improvement from the Bruins in the coming years, but this isn’t the same Pac-12 Kelly used to beat up on with Oregon. The conference has improved up and down the west coast, including USC’s return to potential dominance. But it will be good to see Chip and his visor back once again. Speaking of Kelly, his old program (Oregon) wraps up the spring with new head coach Mario Cristobal. Other coaches making their spring debuts this weekend include Joe Moorhead at Mississippi State and Jeremy Pruitt at Tennessee. With Moorhead making his spring debut at Mississippi State, Penn State’s offense could have a new look under new offensive coordinator Ricky Rahne. And with Saquon Barkley and Mike Gesicki gone from the offense, this is now officially the Trace McSorley show in 2018. Entering his third season as Penn State’s starting quarterback, McSorley will be more a leader of the offense than ever before, no longer in the shadow of Barkley and without the trusty hands of Gesicki. Rahne will be tasked with making sure McSorley is equipped at other positions to keep Penn State’s offense among the best the Big Ten has to offer. We probably won’t see a whole lot of McSorley in the spring game, however. With him locked in as the starting quarterback, the spring game may be more about giving some experience and opportunities to McSorley’s backups, including Tommy Stevens. Also, Keegan-Michael Key, a Penn State alum and James Franklin impersonator, will be a guest host. If we don’t see one pass to Hingle McCringleberry, somebody should be fired. 5. Has Texas beefed up the offensive line? In the Big 12, the Texas Longhorns haven’t contended for a conference title for a while. Much longer than should be expected for Texas, at least. The 2018 season may take steps toward getting back to that level, although that may rely most on the state of the offensive line. Because that has been… offensive. Texas hired Herb Hand from Auburn (and Penn State before that, with a previous stop at Vanderbilt) to be the new offensive line coach, and he will be tasked with improving a unit that has been a weak point in Austin for some time now. Given what he has to work with, Hand may need more time to have these guys conditioned and ready to compete, but if Texas can come away from the spring game with their quarterbacks avoiding constant pressure, that would be a start.Then the rest of the offense could really take off for Tom Herman.